The Joe Percy 10k at Huddersfield attracted a record field of 434 runners to tackle an undulating course. 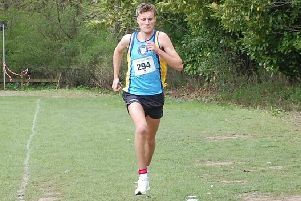 For the second year running, Will Smith of Halifax Harriers won the race in a new club record of 34:12, beating his own record by 22 seconds. Harriers’ ladies were led home by Helen Glover 40:05, who was second lady in the race. Halifax Harriers men’s team were crowned champions again with the ladies coming second to Stainland Lions, who had around 70 runners at the event. Mags Beever, Tanya Blake, Suzanne Patterson, Stefanie Hopkins, Sally Caton, Lorraine Naylor, Gaby Ferris, Helen Armitage, Aileen Baldwin and Victoria Armstrong were the Stainland women in fine form. Harriers and Stainland also had several age group winners. For Halifax, Ryan Barker (37:21, M45), Simon Johnson (37:39, M50), Mark Crabtree (41:11, M55), Geoff Cumber (46:11, M70) and Laura Knowles (46:45, FU18) were successful. There were wins for Lions Mags Beever (F35), Helen Armitage (F50), Aileen Baldwin (F65) and seconds for Suzanne Patterson (F45), Rachel Lumb (F50) and Jan King (M65) while Janet Carter was third among the F60s. Other Harriers times: Michael Gaughan 36:37, Michael King 38:47, Niall Smith 38:59, Ian Whitehouse 39:55, Adrian Thomas 40:07, Harry Johnson 40:30, Charlie Spencer 40:30, Andrew Wiggins 40:49, Paul Berry 40:53, April Caufield 41:09, Johanna Sutcliffe 41:34, Matt Kay 41:48, Mark Knowles 41:51, Liam Spencer 42:15, Will Stewart 42:45, Rob MacDonald 43:56, Mark Gaughan 44:01, John Whitlow 44:11, Marc Rocheteau 44:12, David Nutton 44:29, Rachael Beaumont 44:49, Nigel Rigg 45:21, Robert Hick 45:41, Paul Hopkinson 48:27, Wayne Stevens 48:22, Peter Matthews 48:25, Nigel Taylor 48:36, Hanni Maeer 48:40, Jennifer Hopkinson 50:06, Margaret Deacon 51:23, John Moore 51:38, Chris Greenwood 51:43, Nigel Corns 51:38, Paul Bunker 51:37, Jazz Sandhu 51:52, Samantha Layfield 52:16, Sally Shacklock 52:00, Sam Wright 53:47, David Parrington 54:49, Jude Baines 56:13, Dave Cooper 56:13, Sarah Langan 57:02, Jenny St Romaine 58:48, Keith Midgley 60:50.